Publisher: Atari. Developer: Overhaul Games. Released: November 2012. Genre: RPG. Browsing Steam’s forum on Baldur’s Gate: Enhanced Edition has been particularly eye-opening; frequent complaints of the game being too hard and that it doesn’t work properly is just about the sum of banal discussion. Well, welcome to the world of old-school PC gaming you bunch of numpties. A place where you have to f*ck around tweaking with your graphics card before being able to launch into the b*stard-hard onslaught of enemies, beasts and magic that await along the length of the Sword Coast. 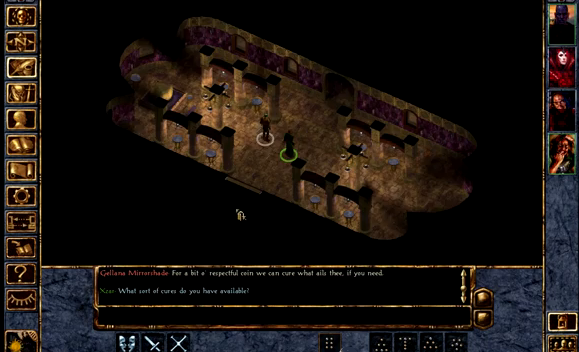 Baldur’s Gate always was a huge challenge and it remains ever so in this ‘enhanced’ format. Gamers looking for an easy RPG be wary, there is no console safety blanket here. The original version has not been trifled with to cater for your lack of mad skillz. Indeed, the Enhanced Edition has forgone the need to do anything incredibly drastic. There’s no new graphical skin to speak of as the original’s clarity remains vibrant enough for a modern audience to appreciate. Equally, the sound and music are identical to what has gone before. A testament to how good such presentation was way back in 1998. What the enhanced edition does bring with it are numerous little tweaks. First and foremost that it runs on a modern PC without odd graphical glitches and disc-swapping of five CDs - six if you include the Tales of the Sword Coast expansion - is now but a distant memory. Furthermore, the inventory screen has been tidied up a bit; the journal is now more user-friendly (but still not perfect); the mouse wheel allows one to zoom in and out of the play area; four new player characters have been introduced; and there are a small number of additional weapons available (such as the Stupifier +1 mace that has a 25% chance to stun – woo hoo!). 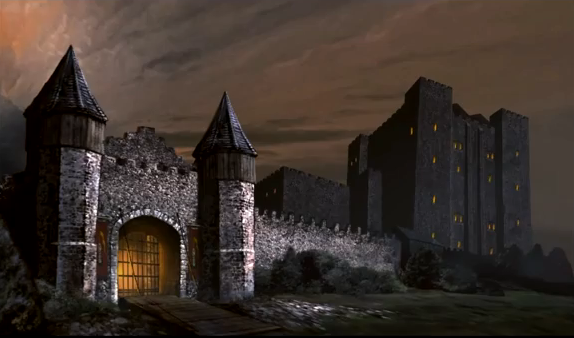 But otherwise this is pretty much the Baldur’s Gate we know so well. Minsc still converses with Boo (everyone’s favourite miniature space-hamster), Jahiera still moans constantly about the blight of cities on the natural world and Sarevok is still a massive c*ck-badger. 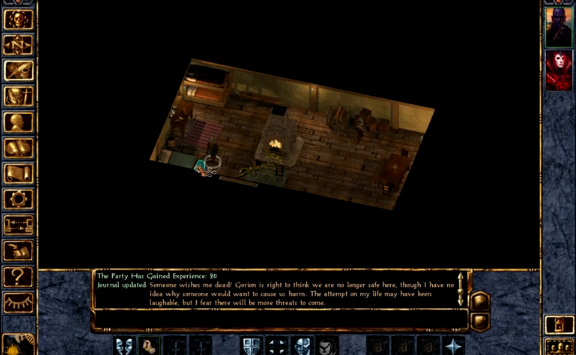 The main changes are actually in the background, with the AD&D mechanics that Baldur’s Gate runs on being updated to cover the latest rule-set. So, there are a few new spells available, dual-wielding is now an alternative to slugging it out with a two handed-weapon or sword and shield combo and additional character kits included in Baldur’s Gate 2 have also been added to the character generation process, such as Monk, Wild Mage and various types of Paladin. Also included, somewhat vitally, are much needed AD&D items such as the Bag of Holding and a scroll case which makes inventory management much less of a tiresome chore than it originally was. No longer are your six characters likely to run out of room on the basis of small gems and individual scrolls taking up a single inventory slot when you can store them in a bag for such things. Arrows also stack up to 80 in a slot. Neat! With one of the original game’s main bug-bears removed it means you can concentrate on perfecting the swords, sorcery and adventuring that makes up the main-stay of Baldur’s Gate. And this remains an absolute delight. Gameplay has been left well alone and it’s still tougher than attempting to eat a tennis ball. The magnificent active-pause method ensures micro-management of your party’s talents so they can be used intuitively in battle. Without it Baldur’s Gate would be more like herding cats. Finding magic items is just as tantalising as previous, ensuring you can slowly build a party that becomes adept at tearing new ones. Yet the game remains perfectly balanced. Stick to the paths at first and you’ll not encounter anything too aggressive that it provides an immovable stumbling block. Go looking for trouble in the deep recesses of the Sword Coast when thoroughly unprepared then expect to have your testicles used as an Ogre Mage’s gobstopper. 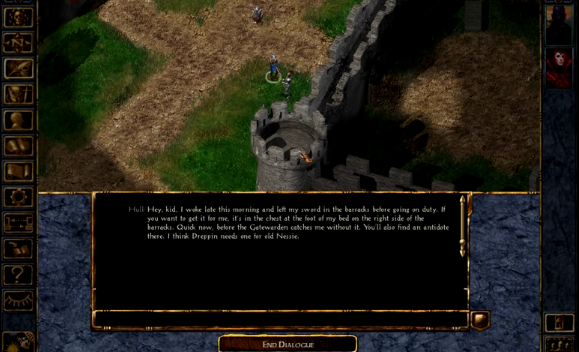 Baldur’s Gate is challenging, but it’s a marathon not a sprint. Time spent levelling your characters is rewarding and with the aid of a quality plot will keep you adventuring well on through the night. Unsurprisingly Baldur’s Gate suffers from the ‘one more minute’ factor; before you know it a whole day has passed in the blink of an eye! However, whilst the gameplay of Baldur’s Gate remains as immense and immersive as it ever was this package is not without its flaws. First up, The Black Pits, a stand-alone adventure that is not integrated into the original game, is total bobbins. With very little adventuring included this simply involves arena battles of increasing difficulty (and numbers) using a party you don’t really care about which becomes a tedious affair relatively quickly. It’s not much additional content (alongside the other tweaks) to really justify the hefty price-tag of the enhanced edition either, particularly when GOG.com has the original game available to work on modern machines for much less.